Good news: Glasgow City Council is looking to reduce traffic on Oswald Street and Union Street (pictured left) in an attempt to cut emissions. Not so good news is that no cycle lanes are proposed but see more detail in item 1.5. Excellent news: consultation is underway on improving walking and cycling on the “Underline”, (see Item 1.3) but bad news is that there is still no word on the status of contraflow for Elmbank Street to allow northbound cycle access to Sauchiehall Street (see Item 3.1 for this). We have lots more for you in this issue so do please read on. **NEW** Glasgow Underline Avenues Project, Sauchiehall Street to St George’s Cross, closes 09 December. Transport Scotland Active Travel Meeting 22 November, STOP PRESS – POSTPONED to the New Year. Section 1: Current Consultations, in date order for responses, except for item 1.7, a late entry – it happens tomorrow, 21 November. We first raised this in Digest 20 and if you haven’t done so already do please get those fingers on the keyboard to support our response: GoBike Station Road Support and comments Letter 171018 If we don’t all get our view in that cycle lanes will act as both traffic calming (by narrowing the road) and encourage active travel, Station Road will become just one more road in Glasgow with speed tables, or even build outs, which we believe discourage active travel. This is one that GoBike member Neil L, has told us about. It doesn’t apply to all of Glasgow but, if it applies to where you are, then you might wish to respond. Positive responses could encourage cycling to school and outdoor cycle practice or training. See here for details. 1.3 Glasgow City Centre Avenues Underline, initial designs for Sauchiehall Street precinct, Cambridge Street & New City Road to St George’s Cross, closes 09 December. This is an exciting project, encouraging walking and cycling from St George’s Cross to Sauchiehall Street. It is proposed to light the underside of the M8, reduce the space given to motor traffic on New City Road and replace the death-defying cycle lane down the centre of Cambridge Street (see photo above). All the information is here and, if you ignore the artistic licence where the weather is better in the future, we hope you will agree, that this is just the thing Glasgow needs and what the City Deal money should be spent on. Click on “Consultations” once you have opened the link to the City Council website for further information, including the survey, to be shown. “Glasgow City Council is currently performing a feasibility study on the introduction of secure covered cycle parking for residents of Glasgow. The provision of these will help remove one of the major barriers to the uptake of cycling, namely the ability to conveniently and securely store a bike. In the first instance we are looking to provide facilities at 50 locations across the city. This will prioritise those areas where housing includes tower blocks, flats and tenement properties. This is for YOU, if you live in a flat with nowhere to store your bike(s), so do please get your community council and/or housing association and/or factor to add their voice to yours. 1.5 **NEW** Glasgow City Centre Traffic Management Order, Bus Priority on Oswald Street (north of Midland Street) and Union Street plus parking changes including West Nile Street, closes 21 December. Behold the current cycling horror that is Union Street (left). Scottish Government Policy and Glasgow City Council, in line with the Low Emission Zone (which we fully agree with Friends of the Earth Scotland, could be better), propose to restrict private motor vehicles from here and the northern part of Oswald Street. That’s the good news. Not so good is that there are suggested parking changes that could have a negative impact on cycling in West Nile Street. If you have ventured onto the contraflow lane from St Vincent Street down to Gordon Street you will be aware that there is car parking on your left with moving traffic on your right. The proposal is to change this parking to disabled parking, something we are definitely not against. However, compared to standard parking spaces, disabled parking spaces are wider (2.4m as opposed to 2.0m), and this could push people on bikes further towards the moving traffic in the northbound lane. There is a solution to this which we have suggested that relocates the cycle lane next to the footway, out of the stream of traffic, and also, with a buffer, out of the door zone. Given that only a couple of years ago we were shown plans by the City Council for cycle lanes right along West Nile Street (where are they now?) this change would be minor in comparison. 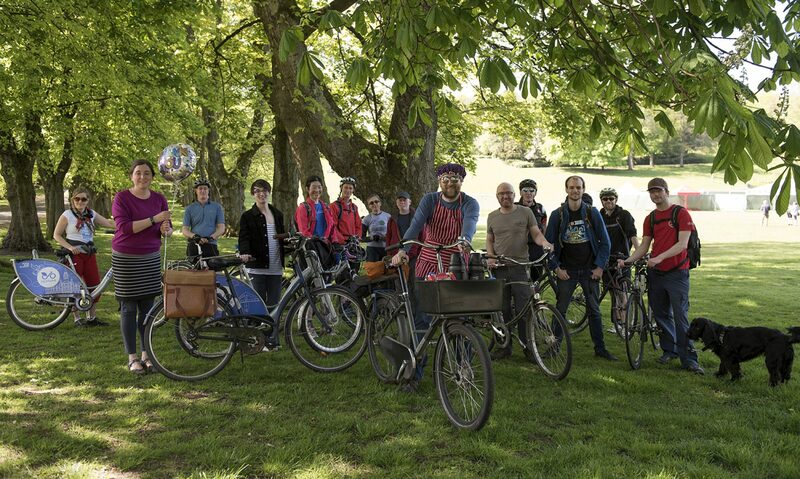 GoBike member Ellie, who’s also a leading light with Get Glasgow Moving alerted us to this survey from the Scottish Parliament’s Rural Economy and Connectivity Committee. GoBike has been campaigning for the default urban speed limit to be reduced from 30 mph to 20 mph ever since our member Bob put his petition forward to Glasgow City Council early in 2015. It’s a short survey, do please complete it. Let’s make our towns and cities safer for us all by reducing motor vehicle speeds. Just in in the nick for time via the Urban Roots twitter, and spotted by our member Brenda, green spaces and active travel routes are being looked at in and around North Toryglen at some presentations and sharing of ideas at Prospecthill Circus tomorrow. 2.1 Transport Scotland Active Travel meeting with Campaign Groups, 22 November, postponed until the New Year. Tricia, the author of this Digest, was, until 5pm today, going to this meeting at Victoria Quay in Edinburgh on Thursday. Our colleagues from Spokes and Pedal on Parliament, among others have been invited. Transport Scotland have postponed, apologised for the short notice and will re-programme for the New Year, when the discussion will include a detailed discussion of the budget allocation for active travel, which was doubled at the last budget. GoBike committee member Rachel and our new co-convenor John attended a meeting with SPT on November 15, along with representatives from Cycling Scotland, Living Streets, Paths for All and Sustrans. There was a consensus that SPT should play a positive role in effecting modal shift from private transport to public and active travel. SPT are consulting with lots of partners, including twelve local authorities to develop a strategy. One of their next steps is to issue a public survey, which is going to look at what is not working across all transport modes. Sounds a bit negative – surely something must be working, but it should help their strategy and it’s clear that they are looking to improve. As soon as we hear the date for the survey, we’ll let you know. With Sauchiehall Street, the Underline, works at St George’s Cross/Woodside, Argyle Street (see Item 3.4 below) and modal filtering in the city centre (ie reducing private cars) and the South and East City Ways the city will really be changing if these two streets become avenues. North Hanover Street links in well to Sighthill and the North East Travel Routes we told you about in Digest 15 and Digest 16 . Goodness, it’s almost like there’s a plan! Most of you will be aware that work is proceeding on the cycle lanes on Sauchiehall Street from Charing Cross to Rose Street, but there is one factor that really concerns us. Some road changes are being made and one of them is to make Elmbank Street from Sauchiehall Street to Bath Street, or for those of you who navigate differently, from the Variety Bar to the Griffin, one-way southbound, with NO exemption for bikes! Essentially, our concern is that there will be no route from the area around Charing Cross Station to Sauchiehall Street without either going west over the motorway to North Street and then into Sauchiehall Street or going south down Elmbank Street and via St Vincent Street, Pitt Street and Blythswood Square! In February 2017 we submitted this response to the consultation for the cycle lanes: GoBike Sauchiehall Street partial support 280217 and in February this year we responded to the City Council who were not amenable to two-way cycling on Elmbank Street. We have heard nothing since then and so emailed again on 15 November. Here is the grand email chain: Sauchiehall Elmbank email chain 2017-8 The only response so far is from the newly formed Blythswood and Broomielaw Community Council, who were not operating at the time of the original consultation. We raised the issue of consultation on new cycling offences in Digest17 along with the call to action from CyclingUK. 13,000 people responded to CyclingUK, so well done if you were one of them. The consultation closed on 05 November but our MPs are debating this today. Last week CyclingUK put out a call to its members to contact their MP, which some of you might have responded to. If you didn’t you might want to check the link and let your MP know your view. “Last Thursday we displayed the feedback we’ve gathered so far and gave you the opportunity to put your ideas into designs using a 3D miniature model kit and maps of the area. To view the information on display and photos of the event please visit our latest project blog. Also on Glasgow City Council’s Avenues website page is this news: “Argyle Street eastwards from M8 junction 19, Trongate and Dixon Street: consultation on these initial proposals took place in June 2018 and has now closed. The visualisations used for that public consultation have been archived under Related Documents.” So it’s looking good, folks. 3.5 New bridge linking Yoker and Renfrew gains approval. Neil L told us about this news from Renfrewshire Council. Scottish ministers have approved the construction of a new opening bridge across the Clyde – and it will have cycle lanes, we are told. See here for details. Quite an exciting bumper bundle there – do get your responses in to ensure Glasgow City Council staff get a lot of mail in the run-up to Christmas!